Hold onto your hats if you are anywhere near the CINCH RSNC camp! CINCH RSNC is pulling out all the stops to make CINCH RSNC Ranch Sorting the biggest and best there is! The opportunity for tremendous growth is here, and CINCH RSNC intends to seize the moment! No other cowhorse sport is as contagious as CINCH RSNC Ranch Sorting. There is no question that success in the sport of CINCH RSNC Ranch Sorting is more attainable than in roping, cutting, versatility ranch horse or any other cowhorse event out there. There is a place for riders of all levels at CINCH RSNC events – that is being proven by the current membership! The 2016 National Finals set an all time record in Sorting or Penning for the number of teams. The membership is already the largest within the sport – now it is going to EXPLODE ! CINCH RSNC is giving a free membership to all new contestants that join at anytime during the 2018-2019 season. This is CINCH RSNC’s way of welcoming new contestants to our sport! This phenomenal offering has been made by only one other national association; when Denny Gentry sold his team roping company to Equibrand, they opened their doors with the offer of a free one-year membership. That association grew to the tune of 20,000 new members in that year alone! WOW! The current potential for growth in the sport of CINCH RSNC Ranch Sorting is unprecedented! No other cowhorse competition has as much to offer to such a wide variety of riders. CINCH RSNC sorting takes place in a controlled environment where a rider can set his or her own pace; less cattle are required for a greater number of teams; it is a timed event where politics do not affect the outcome; contestants of all ages and abilities can succeed in a competition made fair by ratings and a handicapping system; the variables make it challenging and exciting; furthermore, it can also be a great schooling experience for young horses! Recently, CINCH RSNC polled our association’s producers and contestants in order to find-out what they thought the association could do to increase participation. When asked about the biggest barrier faced when introducing the sport to others, producers and contestants both felt that the membership fee was a major factor. Many potential contestants were sitting in the wings wanting to try the sport before they committed to a membership. After exploring the possibilities, many people agreed that the offer of free membership would be a huge advantage to the association. FREE MEMBERSHIP will be a win/win/win/ win situation for everyone involved! Those who have been hesitant to venture into the unknown due to the cost of a membership will now be willing to give CINCH RSNC Ranch Sorting a try – we all know they will love it! Producers will see an increase in contestants and entries at their events thus making them more successful! CINCH RSNC, as a whole, will see more producers willing to sanction events which will bring more sponsors with prizes to CINCH RSNC events including the CINCH RSNC World Finals! Being a part of this great association, dedicated to the sport that combines timed event competition with true to life cow work, should be a reality for anyone and everyone who ever wanted to be a part of this great ranching lifestyle! CINCH RSNC is making it happen! 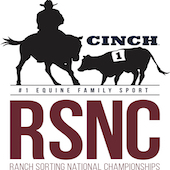 As CINCH RSNC rockets into a new era in Ranch Sorting, don’t miss the celebration of our great sport at the 2019 RSNC World Finals in June. This event will be filled with fun, exciting CINCH RSNC Ranch Sorting competition!